I've been digging through CRMgeo as one potential representation for Getty TGN. I attach a cleaned Turtle that's easier to read (for people who rarely use Protègè). In particular, I've corrected the prefixes. 1. It would be good to define domain & range for all properties (e.g. Q7i doesn't have them). owl:inverseOf does not automatically make any assertion about range & domain from those of the forward property. 2. The spec quotes GML time expressions, but geo:Geometry is grafted under crmgeo:SP5_Geometric_Place_Expression, with no relation to Time Expression. 3. If 2 is intentional, I would expect crmgeo:Q10i_place_is_defined_by to be related to geo:hasGeometry ? 4. crmgeo:SP5_Geometric_Place_Expression is subclass of crm:E47_Spatial_Coordinates, which has direct link to Place (crm:P87i_identifies). Is it ok/permissible to use this link, should it be considered a shortcut of Q10+something? 5. The deeper question is that Place (just like Time-Span) is not considered geo:Feature. Looking at the other slide, geo:Feature is equated to "real-world phenomenon", whereas Place is not considered such, in line with Issue 201 "there is no more substance to a place than the area". crm:P2_has_type aat:1234; # "general region"
crm:P89_falls_within tgn:1000001-place. # "North and Central America"
geo:asWKT "Polygon((-92.0160 43.1560, -92.0160 48.8120, -82.4910 48.8120, -82.4910 43.1560, -92.0160 43.1560))"^^geo:WKTLiteral. Could one of the authors (Gerald Hiebel, Øyvind Eide, Mark Fichtner, Klaus Hanke, Georg Hohmann, Siegfried Krause) please send it? Thanks for the turtle code. 2. The spec quotes GML time expressions, but geo:Geometry is grafted under crmgeo:SP5_Geometric_Place_Expression, with no relation to Time Expression. I don't have experience with GML time expressions, TGN doesn't need them, and I plan to use WKT only... But is this intentional? It is not intentional. 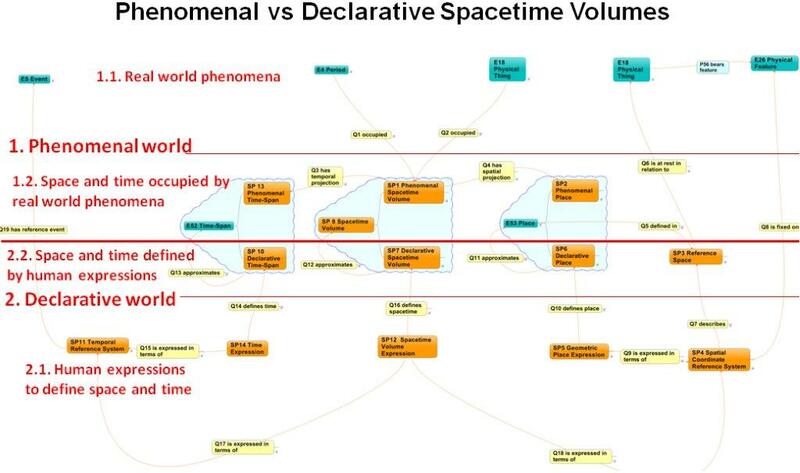 We only introduced Time Expression and Spacetime volume Expression after making the alignment to GeoSPARQL. I believe they should be subclasses of Geometry too. If we want to be more precise we have to go into the GML tree and assign them to the subclasses related to time for the time expression. Have to take a look after solving 2. Depending if it goes to a SP2 Phenomenal Place(Shortcut for crm:E47_Spatial_Coordinates crmgeo:Q10 defines: crmgeo:SP6 Declarative Place crmgeo:Q11 approximates crmgeo:SP2 Phenomenal Place) or SP6 Declarative Place where it should be equivalent to crmgeo:Q10 defines. This is not intuitive to me, since many other ontologies consider Places to be Features (e.g. GeoNames, LOCN) Do I understand this right? This is truly a deeper question, which is related to the problem that in the definition of feature in the end a feature can be anything and this does not help in an ontology. I believe the ontological separation of Place and the thing occupying the Place or defining the place makes sense for a lot of questions but in specific cases it is also usefull to make a double instantiation as proposed in the latest version of CRMsci (http://www.ics.forth.gr/isl/index_main.php?l=e&c=663) where S20 Physical feature is a subclass of E26 and E53. But this is probably better discussed than in a mail and you are right it's a quite fundamental question. SP6 Declarative Place sounds right to me. The SP6 Declarative Place is defined by something like a "Natural Language Place Expression": ("area around the Great Lakes"). We considered in the start to include these expressions in CRMgeo, but would have needed more research on that. Øyvind knows more about these things, but they are not part of CRMgeo (yet). In the end what they do is define SP6 Declarative Places or point to SP2 Phenomenal Places. The coordinates tgn:3000034-point, and tgn:3000034-box; do not define the SP6 Declarative Place but approximate the place that is defined (crmgeo:Q10i_place_is_defined_by or a new property) by a "Natural Language Place Expression". So in this case we have 3 Declarative Places. The one identified by tgn:3000034 and meaning the area around the Great Lakes and two SP6 Declarative Places tgn:3000034-point, tgn:3000034-box that approximate tgn:3000034. That's my fast guess, comments from Øyvind and Martin would be needed. nutshell, the idea is to make GIS and LOD work together more easily. and GIS than Linked Data. please let us have your use cases. In the 32nd joined meeting of the CIDOC CRM SIG and ISO/TC46/SC4/WG9 and the 25th FRBR - CIDOC CRM Harmonization meeting, the CRM-SIG decided that this issue remains open until someone is interested about the mapping between CRMgeo and TGN.